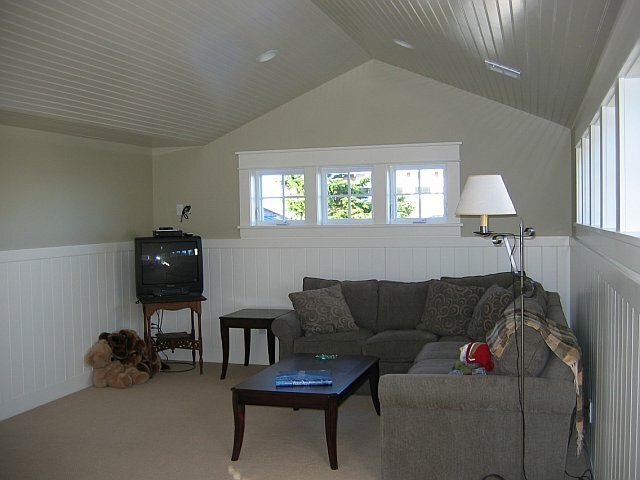 Gearhart Beach House in Gearhart, Oregon - 1 Block from the Beach! 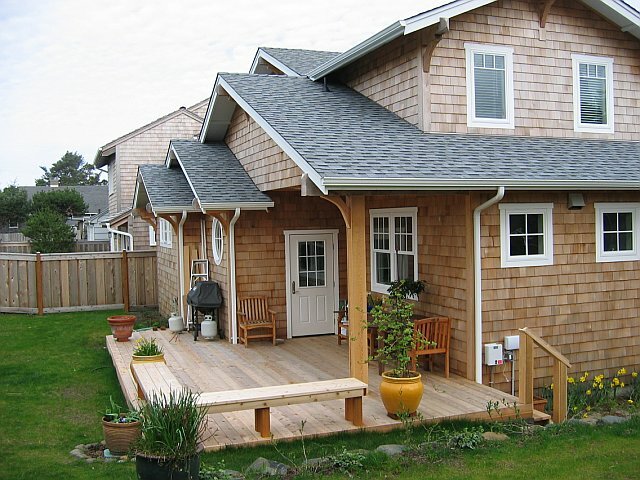 Our wonderful beach cottage on a large lot. View of the front of the house and the parking area. With French doors going into the house. This is a wonderful place to have your morning coffee and read the paper. Standing in the dining room looking toward the living room. 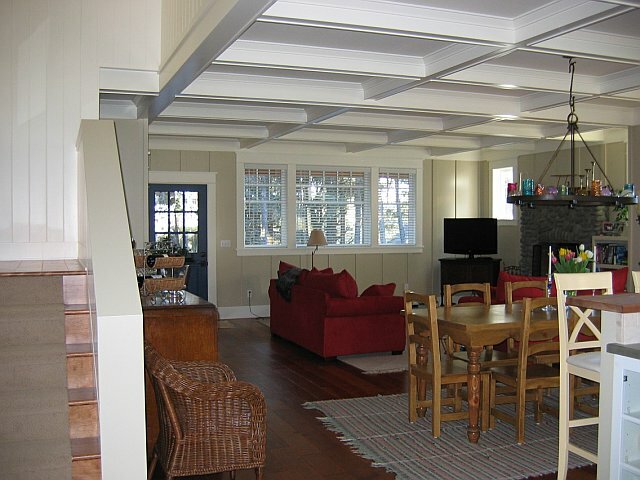 The house has 9 foot ceilings, and the box beams are beautiful. View from the hallway to the living room. Standing in the dining room looking towards the kitchen. 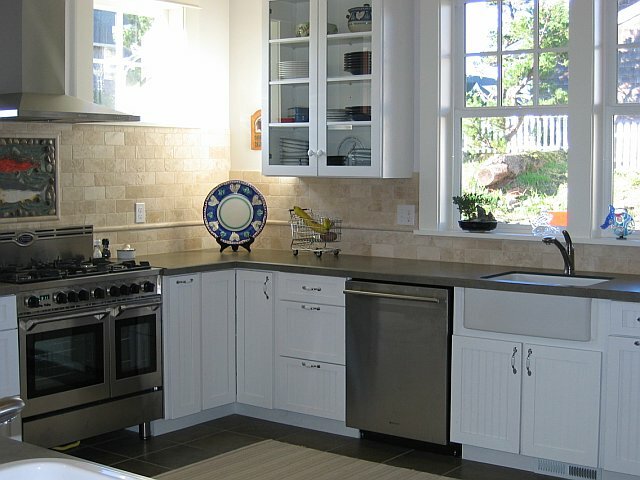 This kitchen has everything a gourmet cook would ever want. 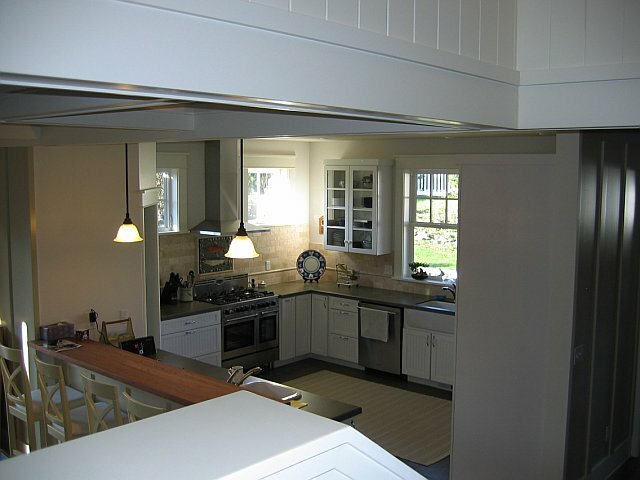 A great space for family cooking. Looking from the living room towards the upstairs. As you can see everything is very open. From the landing looking towards the kitchen and island. Kitchen area, the windows face out towards the backyard and overlooks our large deck in the back. 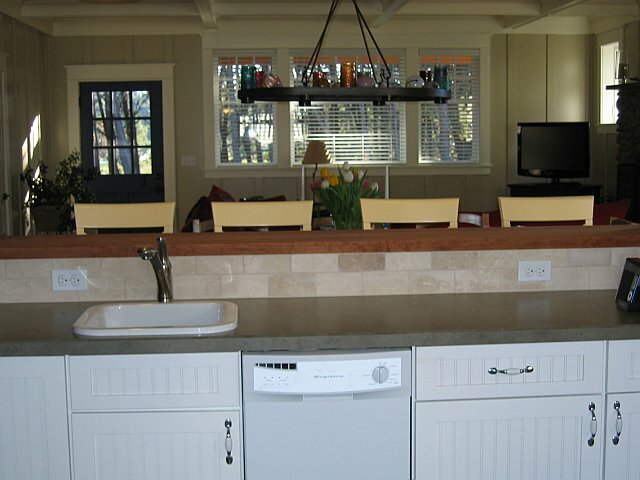 We have a second sink and dishwasher in this island. 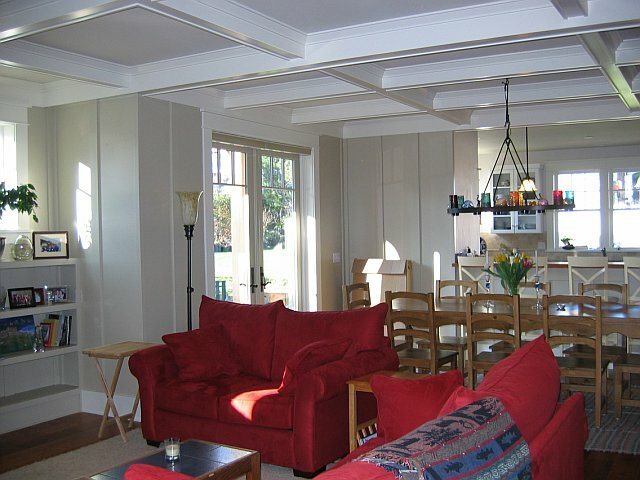 The living room is a great gathering place for friends and family. Our family handpicked all the rocks that make up the wood burning fireplace. A look from the front door looking towards the French doors that walk out onto the south deck. 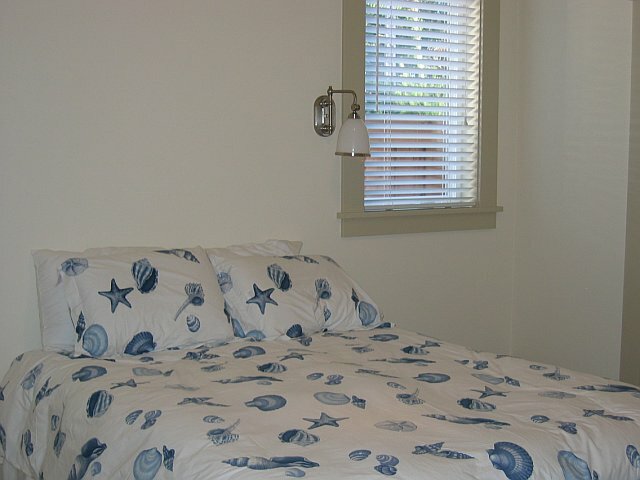 The front bedroom is the master bedroom with a king size bed, and has a large walk in bathroom. 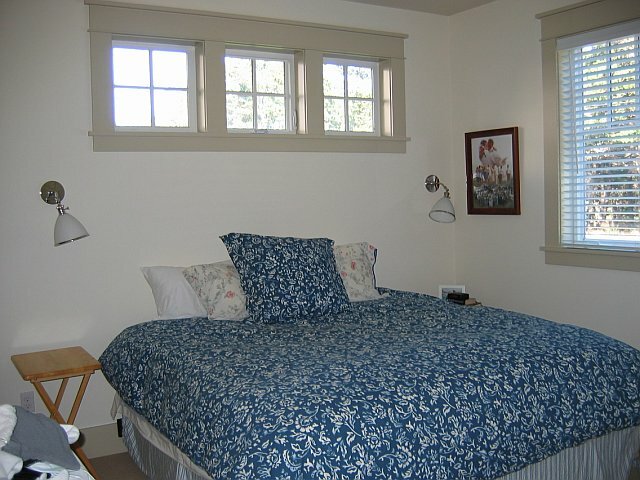 The middle bedroom is one of the largest with a queen bed. This bedroom and the back bedroom with twin beds share a full size bathroom with a tub and shower. 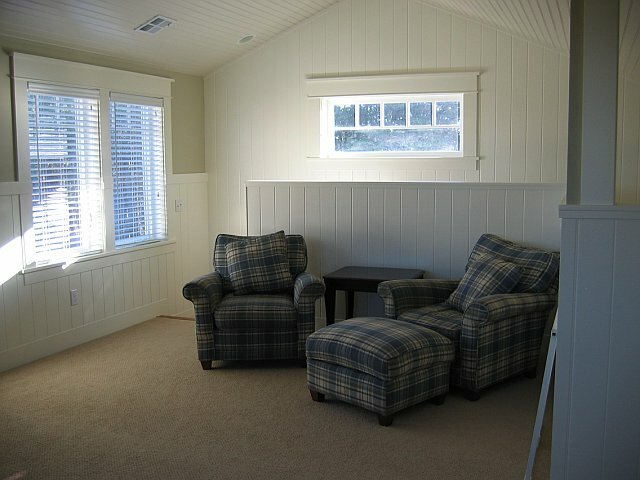 This is the family room upstairs. It has a view of the ocean from this room. The upstairs bathroom and bedroom are off from this room. The upstairs bedroom has a queen bed. Our family room has a TV, DVD, and 2 day beds. 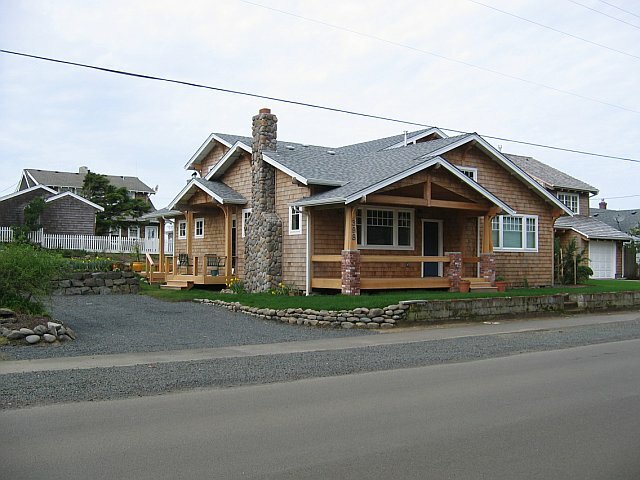 This Gearhart beach house sits on a large lot with a big back and side yard. It is on the south side of Marion, which is the beach side. 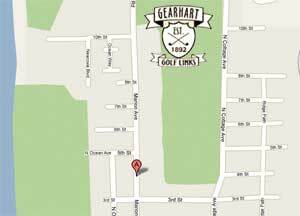 We are one block back from the beach access road, just a short walk to the beach. 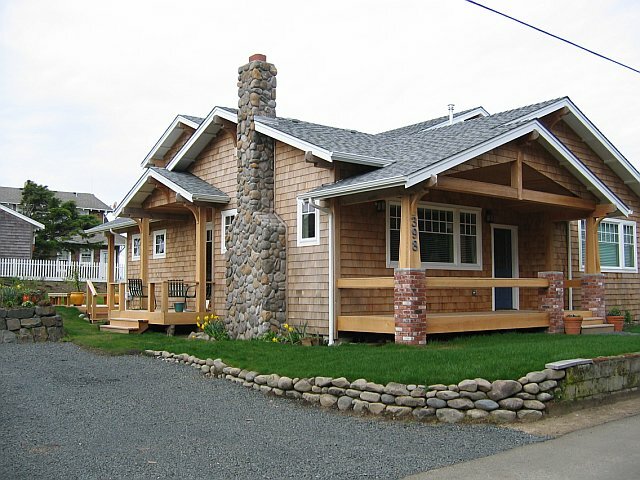 We have recently rebuilt this traditional cottage home. 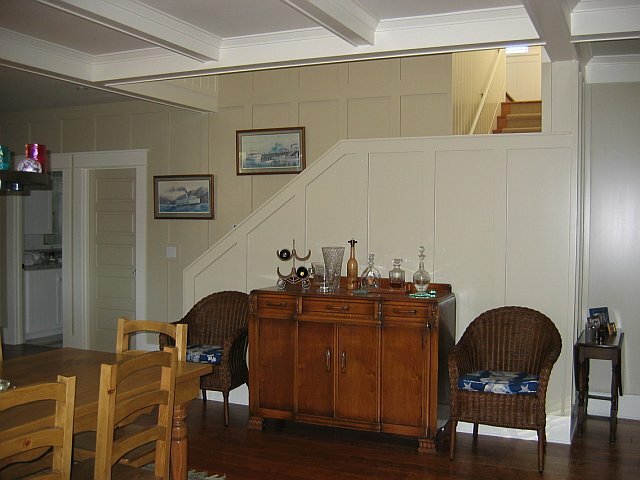 Wonderful wood working and craftsmanship throughout our 2400 square foot house. 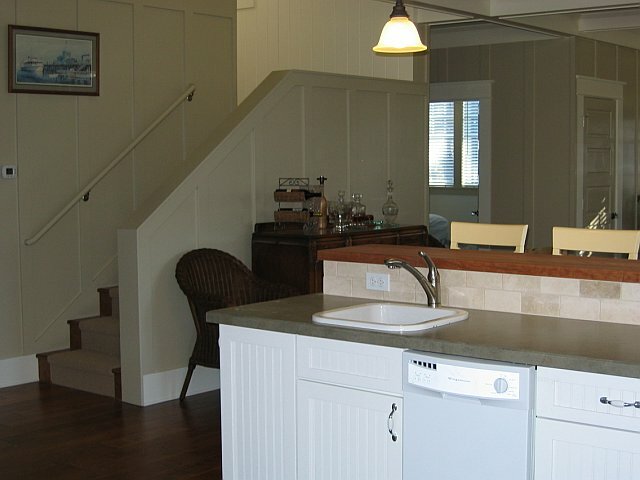 The kitchen has all new appliances including gas range, microwave, tile floor, and all the amenities for gourmet cooking. 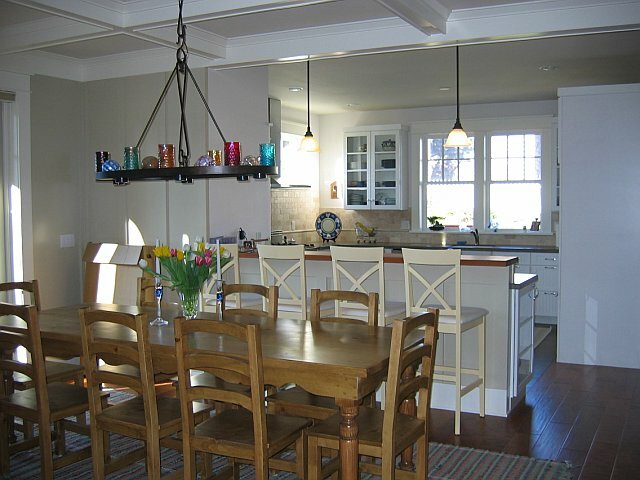 The kitchen, dining and living room areas were designed with families in mind. From the kitchen you can see what is going on. 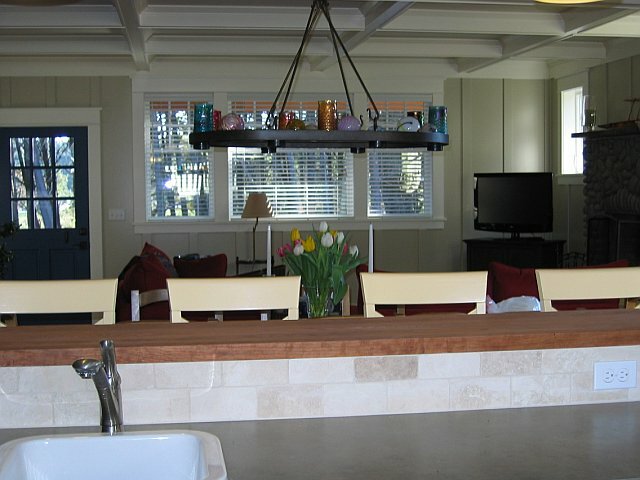 There is an island bar that seat 4, and our dining room table can sit up to 12. 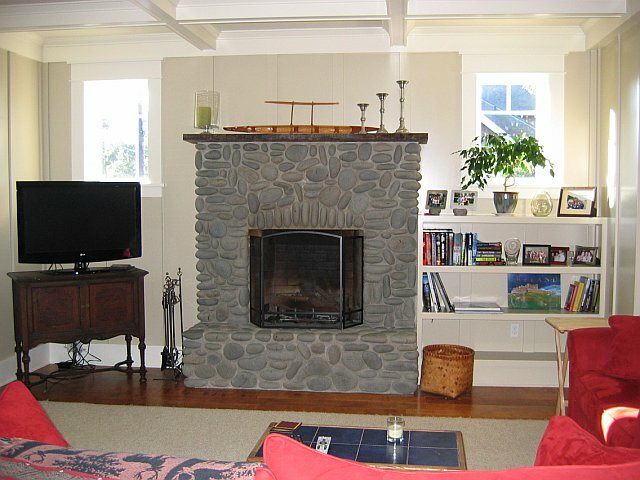 The spacious living room is light and bright with comfy furniture with a beautiful beach rock fireplace that is a wood burning fireplace. 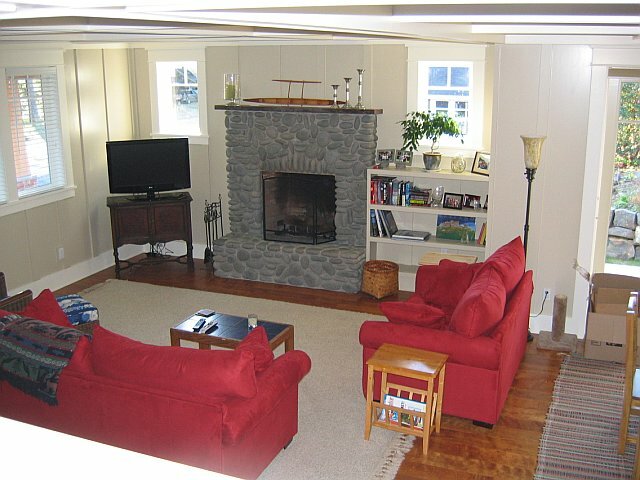 Flat screen HD TV/DVD in living and in the family room upstairs. Off from the dining room is a small south facing deck. French doors open out to this deck. A wonderful place to have your morning coffee and read the paper. 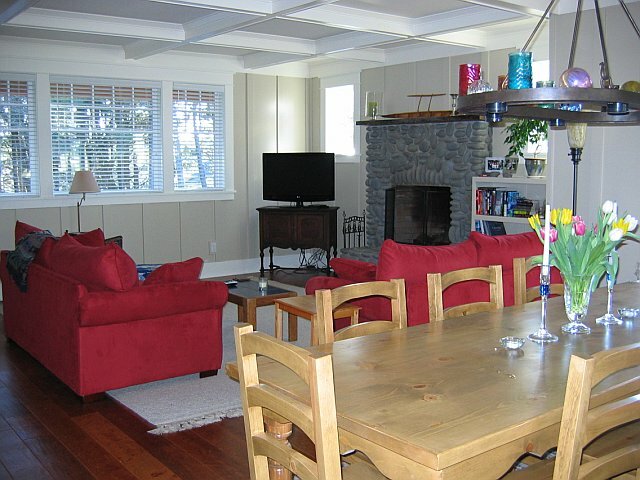 The rear deck has patio furniture and a gas grill – perfect for all those summer nights of entertaining.